Trade focus: New stock arrives; but who or what is Pronar? It was Poland that led the fall of European communism in the 1980s and, in doing so, opened up the former Soviet bloc countries to trade with the west. It was unfortunate that during the years of suppression its manufacturing and engineering industries suffered a great loss of reputation. A good deal of this was malicious rather than deserved but, with a new dawn, many enterprises sprung up from the ruins – and set about proving they were as competent as any. One such business is that of Pronar Spa based at Narew – a town north-east of Warsaw. Founded in late 1988 to import tractors from the Minsk Tractor Works, it gradually shifted to production of its own units (based on Belarus designs) using locally-sourced components. In 2003 the company started to make trailers of various types for agricultural and, a little later, municipal use. These ranged from 3t to 23t and included muck spreaders, as well as livestock and timber transport units. That early venture into trailers has expanded dramatically since. The product line-up now includes chaser bins, push-off (ejector-type) trailers, self-loading bale trailers and a range of grassland machinery that encompasses mowers, tedders, rakes and two models of round baler. 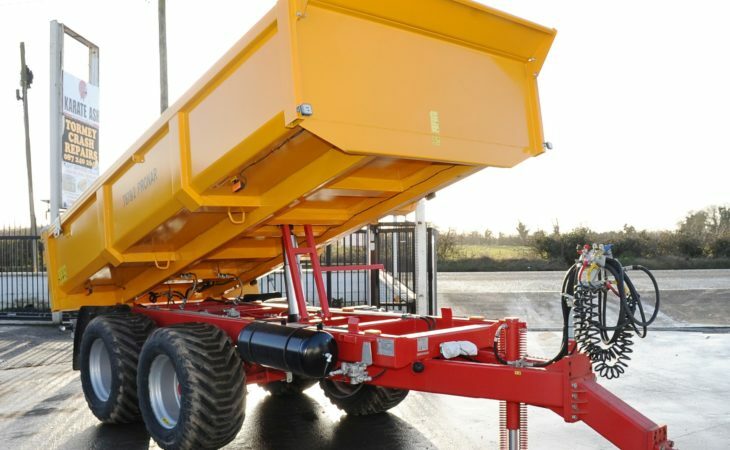 Fertiliser spreaders and mixer wagons also appear on the product dossier; this is before the myriad of municipal and forestry products are taken into account. Today the company employs about 2,000 people; it also claims to produce 50% of the agricultural machinery in Poland and presently uses 600t of steel a day in its various factories. These are impressive figures, which suggest that Pronar has been enthusiastically developing its market presence both at home and abroad. Over the past couple of years it has established a sales organisation in the UK, which is claimed to be thriving. It has now appointed a new sales agent here in Ireland. The new agent is Plant Services Ireland – based at Ashbourne, Co. Meath. Started by Brendan Commins, the firm specialises in the maintenance and repair of construction plant and agricultural machinery. The company is not new to the sale of equipment; it already deals in Dynaset hydraulic power-packs and Rotar demolition and cutting attachments (for excavators). Entering the agricultural machinery field, however, is a step in a different direction – and he does not underestimate the challenge. His confidence is boosted by his faith in Pronar machinery. Brendan points out that “the build quality is excellent for the price” and that, having been aware of the brand for a while, he is “delighted to be given the opportunity to sell it here in Ireland”. Alongside the dump trailer is a hook-loading trailer which, at first, may not appear to have much relevance to Irish agriculture. However, Brendan explains that they are selling well in the UK on farms, where there is a drive to reduce field traffic or where delicate crops need to be handled. “Loading directly into skips from the harvester can often reduce a transfer operation [into a truck at the field edge],” explained Brendan. He can see the practice gaining acceptance here. The appointment of Plant Services Ireland as a distributor for Pronar equipment is a very recent move on the Polish company’s part. Brendan is still planning the future strategy and awaiting more stock to arrive from the UK. He hopes to attend various shows around Ireland and will be looking to open a depot in the west – possibly in the Tipperary or Limerick area. Servicing the machines on a nationwide basis apparently poses no difficulties; he claims to already have a network of available fitters around the country working on both plant and agricultural equipment. It is an unfortunate perception that products from eastern Europe still sometimes carry the taint of rather primitive design and build. Yet there is a growing awareness that to carry such prejudices into the modern age is somewhat unfair and is often a poor reflection of reality. There has been a great deal of modernisation and investment in these countries over the past quarter of a century. These products deserve to be judged on merit – rather than previous propaganda.